Singapore is a country full of beauty, but it’s also heavily urbanized. Because of that, finding the perfect backdrop for pre-wedding or actual day wedding photos might be a tricky task. In case you’re struggling to find that perfect backdrop for your wedding memories, we’re here to help you. 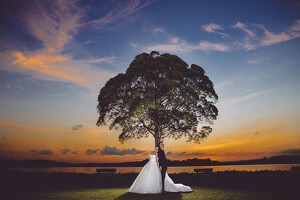 We’ve read Pixioo Reviews, a top listed studio for wedding photography in Singapore and asked them for a piece of advice. So, here are some of their favorite shooting locations! This bridge is no ordinary bridge, but a ravishing work of architecture lined with wooden planks that will make your wedding photos sophisticated, glamorous and modern. With the luscious greenery of the nearby sites and the series of undulating curves of the Henderson bridge, this spot will add both artistic and romantic touch to your wedding photo album. Here, you can arrange your photo shoot either in the day or night, because at night the whole bridge lights up and constantly changes its color. With large expanses of open space, a huge rain tree and a viewing tower that overlooks the area, this reservoir allows much room for creativity. You can make use of balloons and parasol, or you can opt for picnic themed photo shoot. The solitude of a rain tree, which looks like it came out of your childhood storybook, will make your wedding photos romantic and special. In case you’re adventurous and fun, the Night Safari, the Mandai Orchid Gardens and the Singapore Zoo are located on the margins of Upper Seletar Reservoir. With its rocky shoreline and vibrant sun, the Punggol Beach will give additional texture and warmth to your wedding photos. The sunrise and sunset at this beautiful beach are picture perfect and they’ll add a soothing effect and romantic touch to your big day album. Bring parasol, balloons, shawls and similar props for the photo shoot and, with the right photographer, you’ll get the images of your dreams!